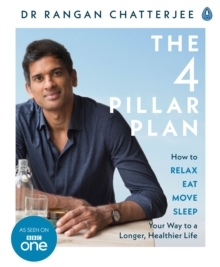 "Rangan's easy, common-sense plan can help everyone live a happier, healthier life" - Jamie Oliver"Rangan is revolutionizing the way we think about health, he will make you feel better than you have in years" - Amelia FreerSunday Times BestsellerAmazon No. 1 BestsellerDr Chatterjee believes that a small change in the way you... RELAXEAT MOVE SLEEPcan make a BIG difference to your lifeEveryone has the opportunity to live and feel better and in The Four Pillar Plan, Dr Rangan Chatterjee - BBC 1's Doctor in the House - creates an easily accessible plan for taking control of your health and your life. Everyday health revolves around Dr Chatterjee's four pillars: relaxation, food, movement and sleep. By making small, achievable changes in each of these key areas you can create and maintain good health - and avoid illness. It's not about excelling at any one pillar - what matters is the balance across all the things you do, including:* an electronic 'sabbath' once a week* aiming for 12 hours every day without food* exposure to sunlight first thing each morning* walking at least 10,000 steps a dayBased on cutting edge research and his own 17 years' experience as a doctor, this book contains fascinating case studies from real patients and is an inspiring and easy-to-follow guide to better health and happiness.